Cat xufla, L. Cyperus esculentus, Ar. fulful al-Sudan, Eng. tiger nut, chufa nut, earth almond, yellow nutsedge. Actually these are not nuts but tubers or edible roots of the weed chufa. They grow to various sizes and shapes. The most common are the round and the elongated, which are at least 7.5 mm long. They only grow in temperate climates at sea level in well-drained level sandy soil. In Africa and India, the tubers have been eaten raw, roasted or cooked as a vegetable. Dried, they can be made into flour. The seeds have been used as coffee substitute. In the Middle Ages, they were found in S. Afrasia (N. Africa, east of the Sahara) and S.W. Asia and were sometimes called habb al-Zelm in Arabic. Muslims brought them to Levante, Spain from Egypt. Now they are cultivated in 16 towns in the province of Valencia. Today, it is the primary producer particularly in the region of L’Horta. The town of Alboraya is the home of tigernuts. They are harvested between mid November and mid December. Then they are washed, ground and let to dry for three months at least. 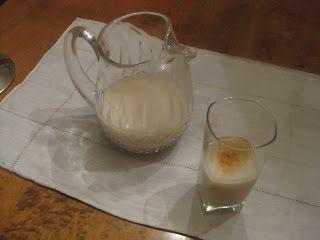 By the 10th C, chufas were used to make llet de xufes (chufa nut milk), the forerunner of horchata (tiger nut drink). Also, it is thought that Sent Soví’s two recipes for ordait (barley water) and for avenat (oat water) are forerunners of horchata. 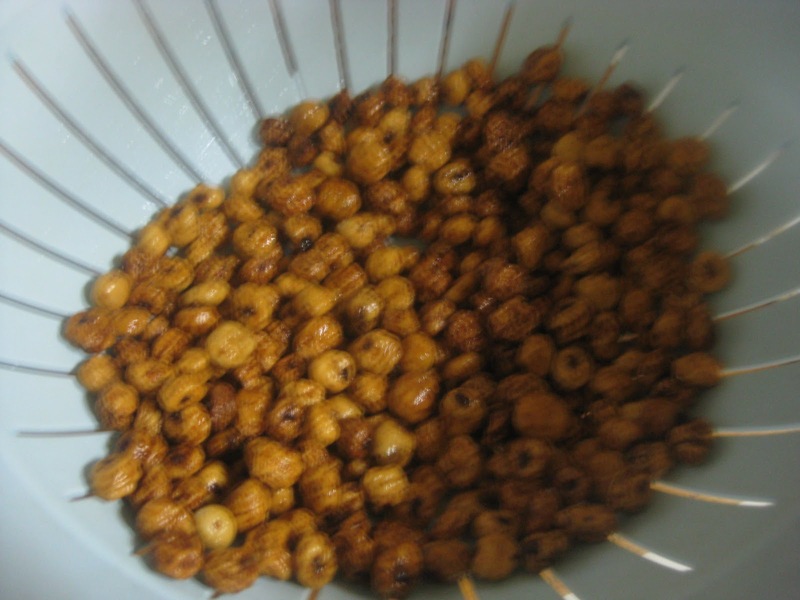 Arabs used the tubers to make other drinks and desserts, including a comfit served as an after dinner sweet. In times of grain famine chufas were ground into flour to make bread. Chufa oil can be extracted from the tubers, which contain 15-20% sucrose and 22% starch. Villena advised not to cut them but to clean out the soil in the wrinkles with the fingernail before eating. Consumption of chufa nuts prevents arteriosclerosis, increases good cholesterol (HDL) and diminishes bad cholesterol (LDL). They contain potassium and phosphate. They activate the intestinal defense mechanism. Tiger nut allergy is rare. Soak them covered with water for 12 hours. If any float, discard them for being bad. Drain them and grind them in a food processor. Slowly add 1 qt water. Mix ell and allow them to sit for 2-3 hours. Sift them through a cheesecloth. Add sugar and mix well. Add cinnamon and lemon zest. Serve immediately or refrigerate to make it ice cold.